Strong, colorful small works in acrylic, watercolor and collage predominate Sarah’s work. Since 2008 her work includes somewhat larger paintings of acrylic on board and canvas as well as one of kind painted floor cloths. 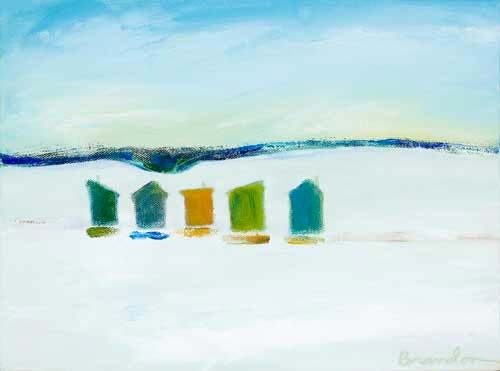 Ms. Brandon is continuously drawn to to explore a variety of mediums and subject matter – allowing for new ways to convey her visual interpretation of light, color and shape and how they relate to each other within landscape.